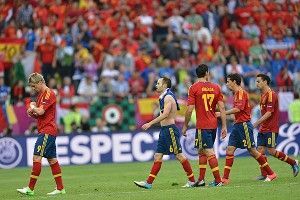 This past weekend, Spain played Italy in one of the marquee matchups of the Euro 2012 Group Stages. The match was held in Gdansk, Poland. It ended in a draw, 1-1, and Spain has subsequently started complaining, albeit informally, about the state of the Arena Gdansk pitch. He can’t complain for a couple of other reasons. Spain might have won 3-1 or 4-1 had manager Vicente del Bosque brought on striker Fernando Llorente (30 goals for club and country in 2011-12) or Alvaro Negredo (17 goals). Instead he went with Chelsea hit man miss-man Fernando Torres, who proceeded to have perhaps the most Torresian game possible. Once considered one of the best strikers in the world, and scorer of the winning goal in the Euro 2008 final, Torres screwed up chance after chance, got his pocket picked by Italy keeper Gianluigi Buffon, and tried a chip that looked more like he was passing to someone in the stands. at all. “It is the same for both teams,” Italy midfielder Andrea Pirlo said. I guess that stands to reason, though. Before moving to Juventus this past season, Andrea Pirlo spent 10 years playing home matches at, that’s right, AC Milan’s San Siro.